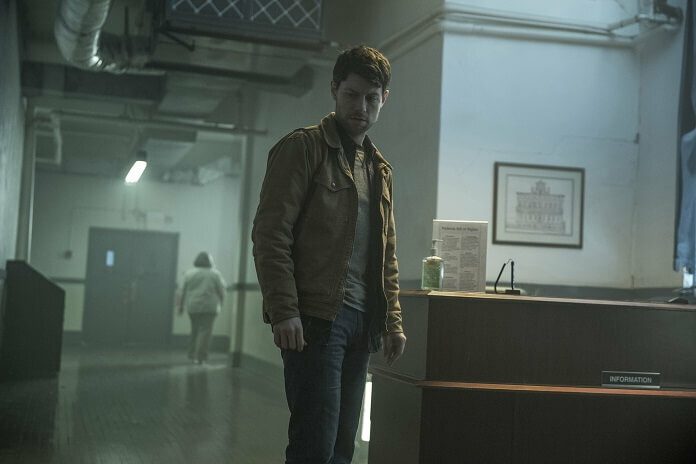 Cinemax has set a July 20, 2018 premiere date for the second season of Outcast. The horror series starring Patrick Fugit (Gone Girl) and Philip Glenister (Kingdom of Heaven) will air on Fridays at 10pm ET/PT. The Walking Dead‘s Robert Kirkman created the suspense drama based on his Skybound/Image comics. Kirkman executive produces with Chris Black, David Alpert, Sharon Tal Yguado, and Sue Naegle. Black also serves as the series’ showrunner. In addition to Patrick Fugit and Philip Glenister, the cast of season two includes Wrenn Schmidt (The Looming Tower), Reg E. Cathay (The Wire), Kate Lyn Sheil (House of Cards), Julia Crockett (Law & Order: Criminal Intent), David Denman (13 Hours), and Brent Spiner (Star Trek: The Next Generation). Other cast members in the second season include Wrenn Schmidt as Kyle’s adopted sister, Megan Holter, a child psychologist who makes it her mission to fix the people around her; Reg E. Cathey as Chief Giles, Rome’s chief of police, who has seen enough to know there’s some truth to his friend Rev. Anderson’s assertions about demons; Kate Lyn Sheil as Kyle’s former wife, Allison Barnes, who has lingering doubts about what happened in their marriage; Julia Crockett as Kyle’s mother, Sarah Barnes, whose apparent mental illness tainted his childhood; David Denman as Megan’s husband, Mark Holter, a by-the-book small-town cop whose temper can get him in trouble; and Brent Spiner as Sidney, whose dapper appearance and smiling demeanor hide malevolence. After being confronted by the same dark forces plaguing Rome, Kyle (Patrick Fugit) returns to town with his daughter, Amber (Madeleine McGraw), to find a deeply shaken Megan (Wrenn Schmidt), who is stricken by flashbacks of her possession and its dire consequences. Reverend Anderson (Philip Glenister) offers to help Patricia (Melinda McGraw) find Aaron, her missing son, and gravitates to a fringe religious service in an abandoned barn. Giles (Reg E. Cathey) tries to convince Mayor Owen Boyd (Toby Huss) to institute a curfew after a newly possessed man evades his grasp. On the advice of Giles, Kyle and Anderson attempt to track down Sidney (Brent Spiner) through his known associates. Written by Chris Black; directed by Tricia Brock. Written by Adam Targum; directed by Loni Peristere.